We often wonder why God has us in the places and roles we're in, perhaps because we believe if we were somewhere else doing something else, we could finally be used by the Lord. 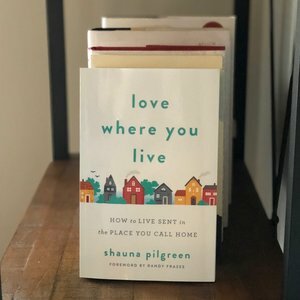 In Love Where You Live, Shauna reminds us that whether God calls us to stay or go, we are a sent people, and therefore our places and roles have divine purpose. Through biblical stories and her own story, she illustrates practical ways we can live as the sent people we are. For those who are new to an area, for those needing fresh eyes for where they already are, and for those needing a jumpstart toward loving their neighbor--you'll find this resource immensely helpful. I meant every word of that endorsement. Shauna has written an incredibly relevant and helpful book, and I recently asked her a few questions about why she wrote it. In the subtitle, How to Live Sent in the Place You Call Home, what do you mean by "live sent"? Living sent is a lifestyle, a perspective, not a t-shirt slogan or an employee badge. It’s the way of seeing where you live and what you do and in whose Name you do it in. To dwell in a place because you have purpose beyond the surface. Sent is a move with purpose. A move typically happens in a set number of hours, days, or months. It's tangible. You can hold the contract, paperwork, packaging tape, and keys. Living sent takes time and it varies from one individual to another. The extroverts out there are hosting a party by the following weekend and us introverts are willing ourselves out the door, hopefully by day 13! Living sent is perspective beyond the boxes. This heart-intensive philosophy embraces what can take place despite the emotions of a move and the potential of what lies outside the walls of your home. Living sent is a mindset. A willingness to love the place you now call home and receive all that it has to offer. You’re living in a place that you never expected to be. Tell us how you ended up in San Francisco. It wasn’t my idea! From my childhood I’d dream of living at the ends of the earth in an obscure village, telling people about Christ. A global US city wasn’t on my list of possibilities whatsoever. To give you the most vague and most honest answer, we ended up in San Francisco because God wanted us here. And you and I both know from experience, that He doesn’t reveal all the whys on the front end. It’s a dance as I describe it in the book. His move, our move. His move, our move. Working in tandem to trust and obey as He leads us - and it’s no typical dance! On paper, we moved to San Francisco to start a church. And that doesn’t come with a “how-to” guide either. Every journey is different. For us, we first believed our call was to start a church in a global and strategic US city where the percentage of Christians was low. Then after a lot of research, prayer, conversations and a trip to SF, we took the posture that we would be SF residents in 16 months and did everything we could to learn from afar before the move, so that when we arrived, the edge from culture shock wouldn’t be so drastic. That didn’t happen like I had hoped either. Mentally, I was there. It has taken my heart a while to catch up! How did you begin to know your city? My approach would have probably looked different if it were just me and Ben, but we had 3 little boys, ages 2, 4, and 6, when we moved. So imagine a stroller and a scooter leaving an apartment complex, holding a phone with google maps, and making sure I packed enough snacks for all of us, cause there was no telling how the adventure was going to go! I wrote a 31 day guide for us (it’s how I’m wired) giving us something to do every day for the first 31 days. This was every bit intentional. Every bit strategic. I had no clue what I was doing though, especially not the outcome. Some days were intense - we’d board the train which required counting heads and limbs and collapsing a stroller and a scooter in guinness book record time! Some days were easier - we made cards for the elderly home across the street from us. It got us outside of the apartment, outside of the boxes, and outside of ourselves. It has proven to be foundational. Getting outside and exploring your city, makes you more okay with making mistakes and learning and figuring things out. We get brave! We get curious. We make friends. We become local. What would you say to someone who is trying to discern if God is calling them somewhere else? Have an internal and external gauge. This isn’t verbatim from the Holy Bible, but I do think it’s got some biblical backing! An internal gauge has questions like: What do I think of this place? What do I connect to here? What sense do I get in my spirit? Can I thrive here? An external gauge has questions like: Can I find community here? Would I contribute to the needs of this place? Can I see myself living here? Could my gifts be used here? Got family - you’ve got to ask these questions for the whole as this move most definitely affects everyone. We answered these questions for our kids as they didn’t get a vote- they outnumbered us! But we most assuredly took their personalities, ideas, thoughts, and questions into serious consideration. I describe this process as the stirring and the urging. Stirring is something that keeps coming to mind that you can’t shake and aren’t always sure where it came from. The urging is like a prompting that often doesn’t make sense, but it’s undeniable the work of the Holy Spirit. Then I say, find someone to share this with and pray with you. Bringing into the light make it more real and causes you to make a decision. What would you say to someone about living sent though they’ve never moved? It means the same for all of us, but looks different to each of us. Moving shakes things up a bit and gives us new perspective, but we can all fall victim to complacency and comfortability and forget the reason why we live where we live. On the lighter side of this, if you’ve been doing the same thing for quite some time, like you can’t even remember how long you’ve been doing the commute, or using that grocery store, or going to the same gym, or hanging in the same circle of friends - it’s time to change things up. Take a different route, go to the gym at a different hour. Open up your circles to newcomers. On a stronger note, see longevity as a powerful tool to loving where you live. You bring value to a community because of your years there. I’m 8 years into calling SF home and I see people I know and can linger on the sidewalk in conversations because of living here this long. The cautionary tale is to pay attention. Don’t fall asleep in your hometown. God is doing a new thing and He wants you to be a part, if not leading the way for those who are moving into your neighborhood. How has the mission of living sent involved your whole family? It’s been a family thing since day one. But I’ve talked with families in all seasons and I can say that this lifestyle can start today and it can be for any makeup of the family. We see that everything we do from work to play to church to community as being a together endeavor. We show up Sam’s baseball games and learn teammate names. We make introductions asap with each year’s teachers as their cheerleaders. We go where they want to go, be it a certain park or favorite restaurant. We help set up and host for small group and neighborhood gatherings in our home. We’re not here for dad’s job. We’re here because God has a plan for all 6 of us. We did tell our oldest one night at bedtime that he kinda has to live here until he’s done with high school, but then he’s free to go wherever he wants to go. That it will be a time for him to ask those internal/external gauge questions. But for now, we’re all citizens of SF and that means a whole lot! Our kids have their own circles and quadrants as they get older in the city, but we operate out of the same hub (home) and when that’s the case, we’re the Pilgreen family. There’s strength in living this lifestyle as a family, same is true as a faith community. Why is observing and understanding the culture of a place important? Woe to any of us who take our previous culture and expect our current culture to get with it! Recall when God sent His people into exile into Babylon. This place was not like where they had come from on so many levels. God told them to build houses, grow gardens, etc. He essentially told them to move into the neighborhood and learn from their new neighbors. When does someone feel valued and seen? When we listen and ask questions and learn from them. The fastest way to lose your job is to come and make changes and ignore all the work and history of the company. Same is true with cultures. Listen, ask questions, learn. You will start to make a difference when you know the difference that needs to be made. What is one step someone can take today to begin to love where they live? Find a new place in town to sit and think and watch. Take someone out for coffee. Do just one of these today. And then I’m going to ask God to meet you there and help you with the next step! Grab your copy of Shauna's book today on Amazon, Barnes & Noble, Lifeway, or Christianbook.com. Find out more about Shauna and how she's loving where she lives at shaunapilgreen.com.